American Robin. Photo credit: Bryce Yamashita. One of the many signs of spring, besides the annoying ritual of “springing ahead” with our clocks, is the return of flocks of American robins. While I saw a couple of pairs back in February, it was just this week that I observed multiple numbers of them in my garden. This got me thinking about how robins know when to return to the Pacific Northwest and after a little research I learned some intriguing facts. While some robins will stay in our Puget Sound area year around, most of them are migratory and head south in the fall, as far as Mexico. At some point in late winter they get restless and start moving back north, following something called the 37-degree isotherm. An isotherm is a meteorological term referring to a line on a weather map connecting points having the same temperatures. At 37 degrees the soils warm up enough for earth worms to come out of hibernation and vertically migrate to the soil surface. This is significant of course because earthworms are the robin’s favorite food in the spring. The males typically arrive two weeks before the females and can be identified by their more colorful plumage. They will eat mostly worms and whatever berries they can find left over from winter. Once the females arrive, the action picks up and this is when we start hearing the incessant singing that can start while it is still dark outside. It is pleasant at first (some ornithologists refer to it as the “dawn chorus”) but it sure does get on my nerves when it starts before the sun comes up. Also, during this time both females and males are collecting mud, sticks, and grass to build the nest, although the female is the one who actually constructs it (because of course us guys could never do it right!). Once the nest is made, it is then that usually four to five eggs are laid. If you have ever wondered what makes a robin’s egg blue, it is a pigment that comes from the mother’s blood. Hemoglobin from ruptured blood cells is transformed into "bile pigments" which are carried by the robin's blood to where the eggshell forms. It takes a couple of weeks for the eggs to hatch and then both parents feed the babies. Once the babies fledge, the male takes them to a roost with other males and teaches them how to fend for themselves while the female builds a new nest and gets ready for another clutch. This can happen two to three times in a season. 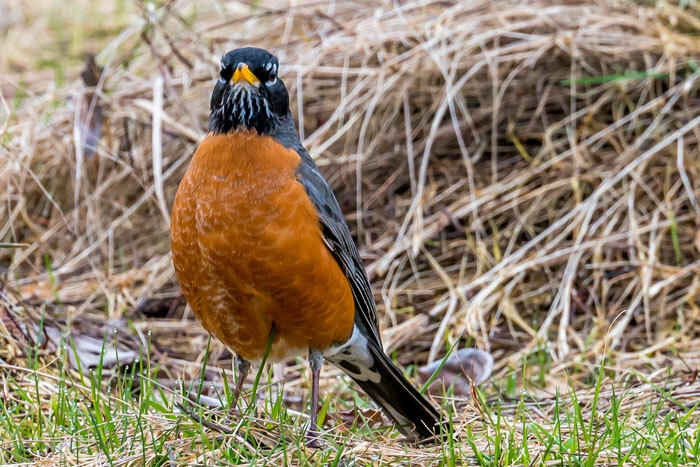 The scientific name for the American robin is Turdus migratorious and it is aptly named considering that robins are known for their aerial distribution of turds, which seem to always land on my windshield, kitchen window or front deck. I have never known a bird with such prolific excretions. They are a veritable flying sphincter and to think that they can do this while in the air is amazing considering that many humans can barely walk and chew bubble gum at the same time. If you ask me, their name should be changed to Turdus prolificus. I think what I enjoy most about robins is watching them hunt for worms. They will run across the lawn before pausing and then turn their head using one eye at a time (called monocular vision) to locate their prey. I could spend hours just watching them do this (but I am easily entertained). Try doing the same and see if you don’t enjoy it too. Just make sure you wear a hat. Sunnyside will be hosting two free classes; ‘Growing Cool Season Veggies’ Saturday March 17, 2018, at 10:00 am and ‘Edible Landscapes’ Sunday March 18th at 11:00 am.